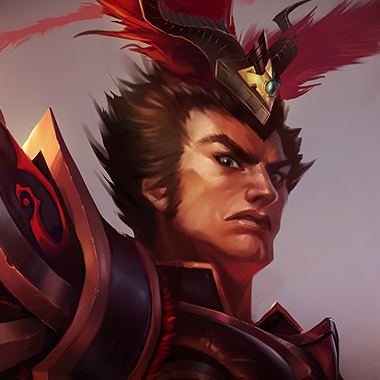 Meet Jarvan IV, Demacian royalty and a, usually, very tanky man. Jarvan is an early pressure jungler that can do a lot of damage with his abilities and passive, especially in the early to midgame. 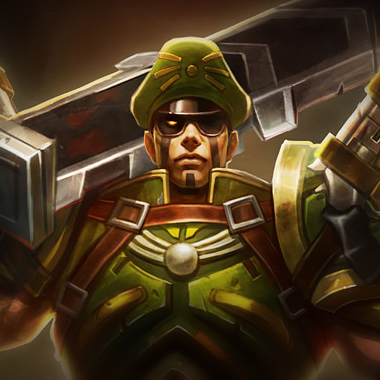 He transitions into a teamfighting initiator in the late game, as he becomes tanky enough tosurvive the damage from the front line and possibly spread his damage an entire team with an ultimate at best, and slowing people with his W at worst, while threatening the backline. Basic attacks deal bonus physical damage. 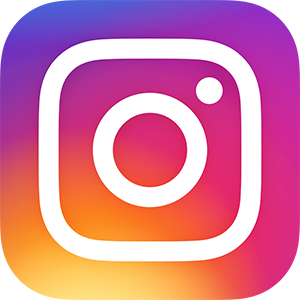 This effect cannot occur on the same target more than once every few seconds. 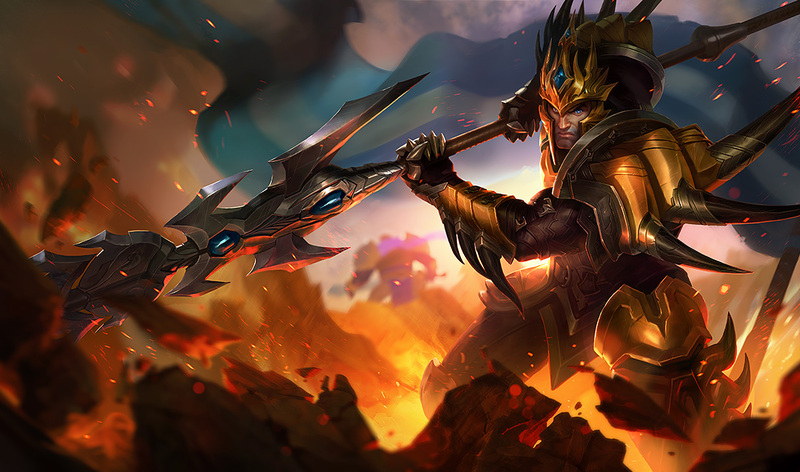 Jarvan IV extends his lance in a straight line, dealing physical damage to all enemies it passes through and reducing their armor for 3 seconds.If the lance connects with a deployed Demacian Standard, Jarvan IV dashes to it, knocking up nearby enemies along his path for 0.75 seconds. 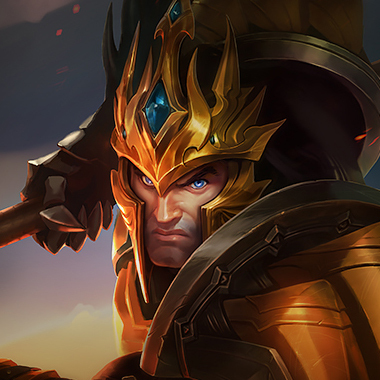 Jarvan IV Slow icon slows all nearby enemies for 2 seconds as well as shielding himself for up to 5 seconds, with the shield increasing in strength for each enemy champion hit by Golden Aegis.. PASSIVE - Jarvan IV permanently has bonus attack speed. 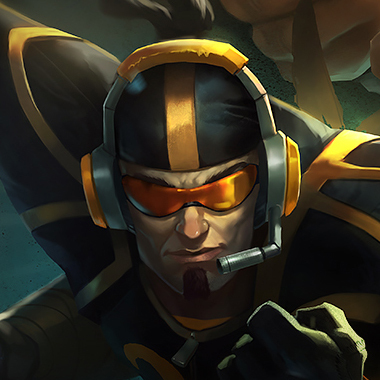 ACTIVE - Jarvan IV throws a Demacian flag to the target location, dealing magic damage to all nearby enemies.The flag then remains for 8 seconds, granting Sight icon sight around it and providing an aura that grants Demacian Standard's bonus attack speed to all nearby allied champions. 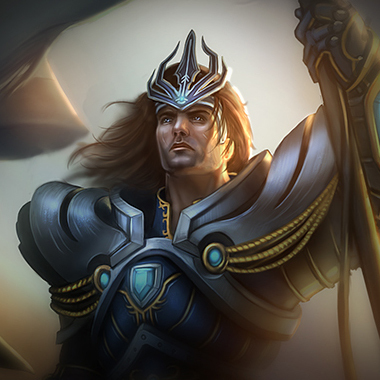 Jarvan IV leaps to an enemy champion, becoming immune to crowd control during the duration and dealing physical damage to nearby enemies upon arrival. Upon impact, he creates a circle of impassable terrain for 3.5 seconds that grants Sight icon sight around it. Jarvan IV can reactivate Cataclysm to instantly destroy the circle. Jarvan's threat level is significantly lowered when either his E or Q is on cooldown. In the top lane,positioning yourself around the minion wave to ensure that trades he takes are sub optimal, and then extending the trade while both his CC combo and escape are down will ensure dominant position in lane. Jarvan is reliant on his E and Q for everything, in the jungle, scouting out his buffs and getting histimers all but ensures you catch him with his abilities down, playing a strong counterjungler forthat situation is optimal. Despite how tanky he becomes, early he has a hard time competing with the damage the jungle monsters put out. Something like an Elise or Lee Sin can catch him in his jungle, and considering how much of his damage is in his E-Q Combo can kill him before he has a chance to run away, setting him behind. Jarvan loses out to anything more mobile than himself. Things that can get out of his ultimate and force him to use his abilities to try and chase them down beat Jarvan. In this way, playing back until he blows his abilities and then punishing him is a viable strategy. 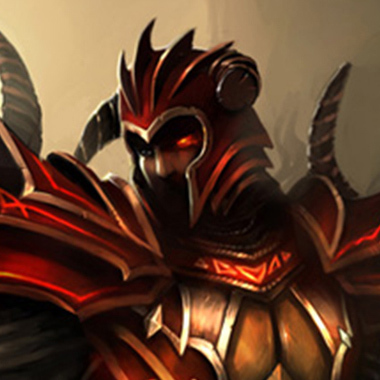 Champions that build sunfire cape make life hard for the Exemplar of Demacia, building it and forcing him to take damage for standing near you, along with your own damage will cause him to start losing trades, especially given the armor and health you gain from the item. 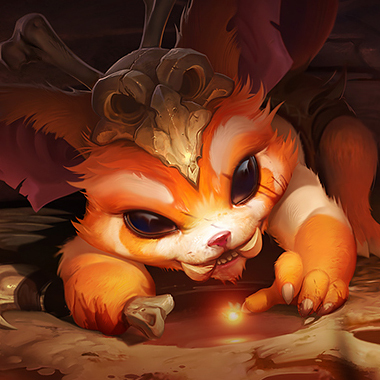 Gnar is a pretty strong laner, period. Before 6, Jarvan has to E-Q to get in harass distanceof Gnar, and if you're positioned correctly, you won't get hit by the knockup. The rest is just kiting back and getting hyper procs from your W. At/Post 6, lane is over for Jarvan. Gnar will have a Frozen Mallet, and his ultimate. If Jarvan engages, Gnar kites him back and with the slow from the Mallet, Jarvan will want to run away. However, he cannot do that, because Gnar picks up hyper procs as well. Jarvan just dies over and over at that point. Jarvan wants to duel? So does the Troll King, and Trundle is far better at it. 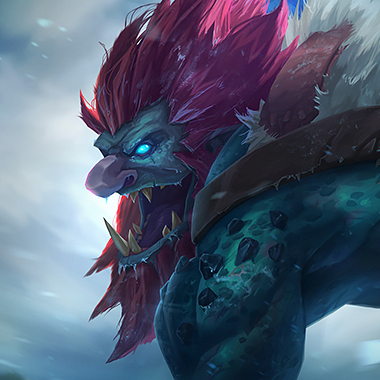 Trundle's passive always gets him better trades and sustains far better as a result of his passive. He steals Jarvan's stats in any fight, and if a fight goes south for Jarvan, he can even interrupt his escape,forcing a flash at best. Post 6 Trundles has an ultimate made for dueling, an AOE dueling field, a stat stealing bite and a pillar to prevent any escapes. Jarvan just has the damage that's being stolen from him by a troll. Most typically this lane ends with a couple of deaths on Jarvans side, followed by a fed Trundle splitpushing their team to victory. I know people like to claim that Nasus has no good lane matchups, but he does. The oneswith obvious poke and engage windows are easy for Nasus. Jarvan is about as obvious as it gets. Nasus gets to lane, begins to farm, and starts an Iceborn Gauntlet, coming back with a GlacialShroud if things are going poorly, and a Sheen if things are going well. With the Shroud, Jarvan doesn't likely kill you, especially with your passive, and at about 10-12 minutes (Depending onhow well you farm) you begin to out damage him. 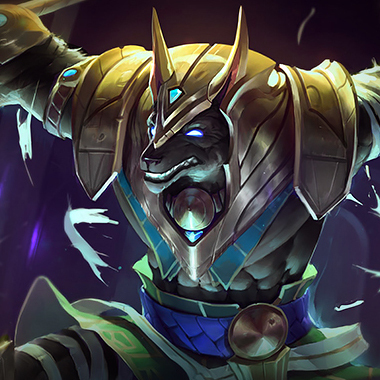 He comes at Nasus with burst, and Nasus hit'sR > W > E > Q > Q > Q...You get the picture. Jarvan has to run and Nasus is already busy farming and lifestealing to full, while using his corrupting potion. Not good at killing things, simply good at taking everything the enemy jungler loves and making sure they can't have it. 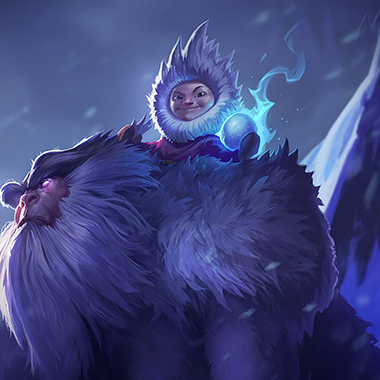 Nunu has both the sustain and Neutral objective pressure required to make Jarvans life hard. He can eat his camps, and take his buffs. Then he can just walk away as if it never happened. Nunu is good at setting a jungle Jarvan behind and has the perma slow power to allow his team to punish an invading Jarvan. 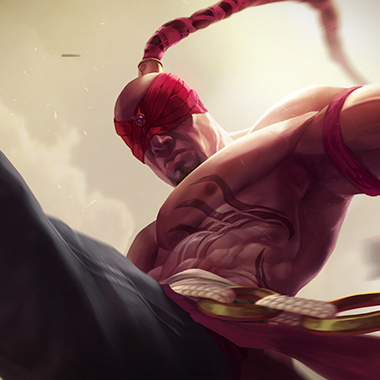 A master at counterjungling, Lee Sin can manhandle Jarvan early, finding him at his second buff, with the right information, and killing him, from then on, it's easy for a Lee Sin to keep control of Jarvan's buffs and control of neutral objectives for his team. By the team Jarvan is back in the game, both champions have transition to tank and Lee Sin has made a far larger impact by virtue of being ahead. Itemizing against Jarvan is simple, his damage is all physical, so buy a lot of armor. Even with the armor shred on his Q, buying more armor will quickly outscale the shred. Frozen Heart is a good item to counter his Demacian Standards attack speed bonus and Randuins is a good item to stophim from running or chasing you, it also decreases the damage taken from his passive empowered auto attacks. Sunfire Cape is a good item to cause him to think twice about tradingwith you, given his melee range, and makes damaging him easier in a tank top matchup.